The Egyptians said that topaz was colored with the golden glow of the sun god. Legend has it that topaz dispels all enchantment and helps to improve eyesight. The ancient Greeks believed that it had the power to increase strength and make its wearer invisible in times of emergency. Topaz sometimes has the amber gold of fine cognac or the blush of a peach, and all the beautiful warm browns and oranges in between. Some rare and exceptional examples are pale pink to a sherry red. 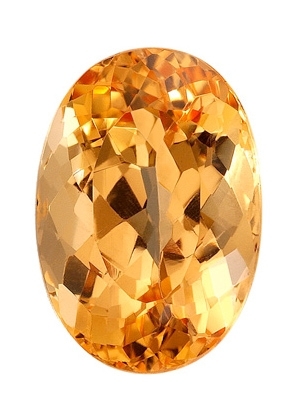 Sometimes peach-colored topaz can be “pinked” by gentle heating. This color change is permanent. The yellow topaz is the birthstone for the month of November. Blue, once the most rare color of topaz, is today the most common thanks to a stable enhancement process that turns colorless topaz blue. After the raw topaz is extracted from the earth and cut, it is irradiated to brown and then heated to a sky blue. This enhancement process is permanent. Topaz is a very hard gemstone, with a Mohs hardness of 8, but it can be split with a single sharp blow, a trait it shares with diamond. As a result it should be protected from hard knocks. Clean with a mild dish soap; use a toothbrush to scrub behind the stone where dust can collect.